Formerly 'Sunnyside Garage'. Visit our new workshop in Basildon or call 01268 724284 for more info. Come and visit our new workshop in Basildon. Our new unit has 6 ramps and a new waiting area complete with a Nespresso machine and some magazines to help you pass the time. Although we can cater for any Alfa Romeo, Abarth or Fiat, many of our clients also bring their other cars to us for essential servicing and maintenance work. In the last few years we have worked on Maserati's, Ferraris, Mercedes-Benz, Porsche and even the occasional TVR. Auto Alfa was established in 1981 as an Alfa Romeo specialist on the London/Essex border. 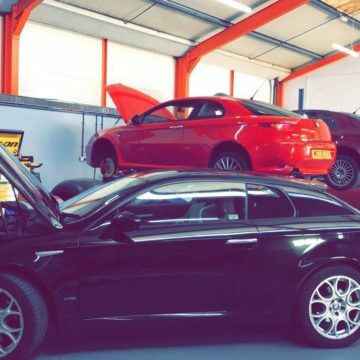 As an Alfa Solus garage we have maintained and cared for thousands of Alfa Romeos over the years and have gained extensive knowledge and experience. We truly regard ourselves as Alfa Romeo Specialists, not only do we cater for your modern Alfa (using latest Alfa Romeo "examiner"), but with Alfa Romeo special tools dating back from the 60's. It is this depth of knowledge which truly differentiates us from other Alfa independent garages. We pride ourselves on our ability to rectify problems where others have failed. Whether your Alfa Romeo is fitted with Weber, Dell'orto or even Solex carburettors to the latest Bosch fuel injection systems we have the necessary specialist equipment to rectify your problems. We believe we offer highly competitive prices yet keeping quality of workmanship paramount. Furthermore we will be pleased to look after your vehicle with not only servicing but MOT's , Body repairs, Electrical and all aspects of Auto Air Conditioning. We can also provide you with a free courtesy car for your use whilst a service is being carried out or alternatively we are happy to take you to our local train or tube stations.